Feta is undoubtedly one of the most famous Greek cheeses. In fact, Feta occupies 70% stake in Greek cheese consumption. The cheese is protected by EU legislations and only those cheeses manufactured in Macedonia, Thrace, Thessaly, Central Mainland Greece, the Peloponnese and Lesvos can be called 'Feta'. Similar cheeses produced elsewhere in the eastern Mediterranean and around the Black Sea, outside the EU, are often called 'white cheese'. To create traditional Feta, 30 percent goat's milk is mixed with sheep's milk of animals grazing on pastures in the specific appellation of origin regions. Now a days, many stores sell goat and cow's milk feta as well. The firmness, texture and flavour differ from region to region, but in general, cheese from Macedonia and Thrace is mild, softer and creamier, less salty with fewer holes. Feta made in Thessaly and Central Greece has a more intense, robust flavour. 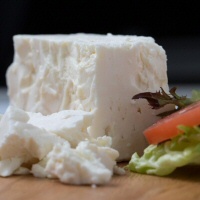 Peloponnese Feta is dryer in texture, full flavoured and more open. 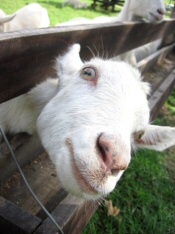 Local environment, animal breeds, cultures all have an impact on the texture, flavor and aroma of Feta. On the whole, Feta is a pickled curd cheese that has a salty and tangy taste enhanced by the brine solution. The texture depends on the age which can be extremely creamy, or crumbly dry. Upon maturation of 2 months, Feta is sold in blocks submerged in brine. The cheese can be used as a table cheese or melted on a traditional Greek salad, spanakopita, pizza or pie. It tastes delicious with olive oil, roasted red peppers and nuts. If required, it can be washed under water to remove the extra saltiness. The salty flavor of Feta pairs well with beer, Pinot Noir, Sauvignon Blanc and Zinfandel.